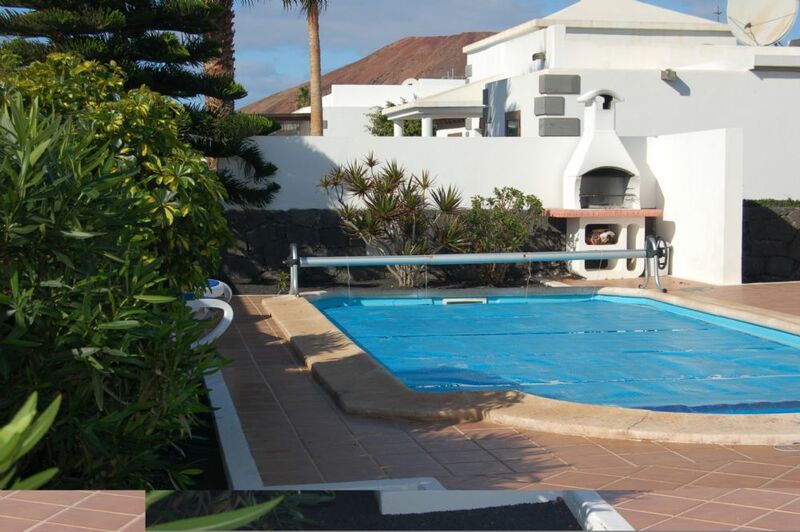 This beautiful villa situated on a quiet and select development and within walking distance of Playa Blanca, boasts spacious and modern accommodation furnished and equipped to a very high standard. The villa has air conditioning fitted to the lounge and master bedroom and also benefits from high speed wireless internet. It has a master suite with its very own enclosed patio with a double luxurious bath - the ultimate in luxury. There is a second double bedroom and a twin bedroom, guests staying here will share the family bathroom with a double shower. 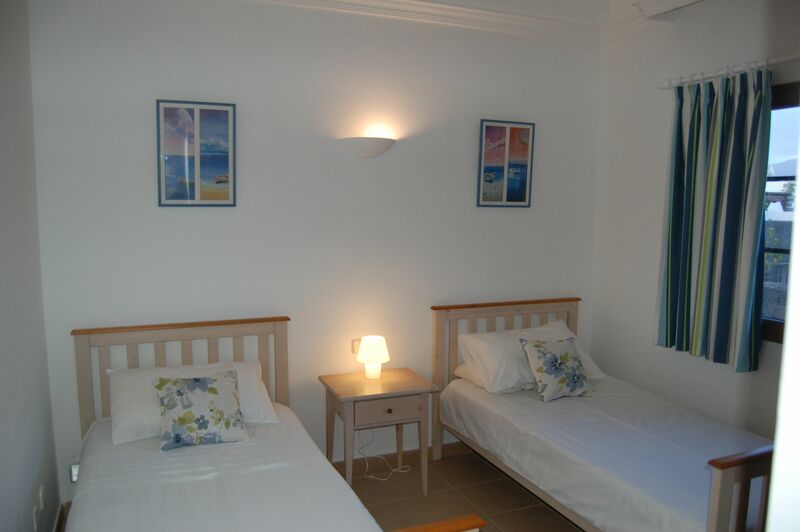 The beds are of high quality and there are fitted wardrobes in two of the bedrooms. There is also a security safe provided. The private swimming pool is 8 x 4m, electrically heated and enjoys a large terrace area fully equipped with six sun loungers, for soaking up the sun’s rays before taking a plunge. The comfortable lounge contains twin leather settees, TV with DVD, CD player and IPod docking station - something to keep everyone entertained (even games for the whole family). The kitchen has a hob, oven and microwave, dishwasher, fridge freezer -in fact everything you could need, including a washing machine and a wide selection of quality cooking utensils. The shaded outside dining area offers a patio dining table and six chairs and is perfect for taking a break from the sun in the day time, or for enjoying an al fresco eating experience in the balmy evenings, whilst taking advantage of the barbeque provided. A central portcullis arch leads you to the beautiful community of Parque Del Rey, which translates to Park of the King. After the only central entrance, you can veer to the left or right which will lead you to one of the two exits of Parque Del Rey. Within the community of 70 villas, you will find a mix of holiday and locals homes. They all have pretty gardens, and gated driveways, some with sea views, and all have stunning views of Montana Roja and the Rubicon Range of Mountains. This tranquil totally flat landscape setting is certainly one to be enjoyed for couples and families alike. Although some of the villas have 2 easily negotiated garden steps. Whether you are pushing a buggy or being pushed in a chair it is a flat and easy route to the sea front and wheel/push chair friendly village of Playa Blanca. If you exit left, you can walk in 8 minutes or so to the mini market Supermerloby, there you can buy holiday essentials, including fresh bread, fruit, vegetables and local vino. Take a right, and the Cordoba Hotel has a supermarket, just 6 minutes or so away. You can use the facilities at the hotel too if you wish. You will pass the bus stop at the end of the road, which is a reliable, regular service. Otherwise, a taxi from Parque Del Rey to Hiperdino the large supermarket in the Village will cost a few euros. You can buy all you need here, including fresh fish, meat and in store baked bread. Head back to your villa in Parque Del Rey, light your BBQ, have a swim while the charcoal is heating up. 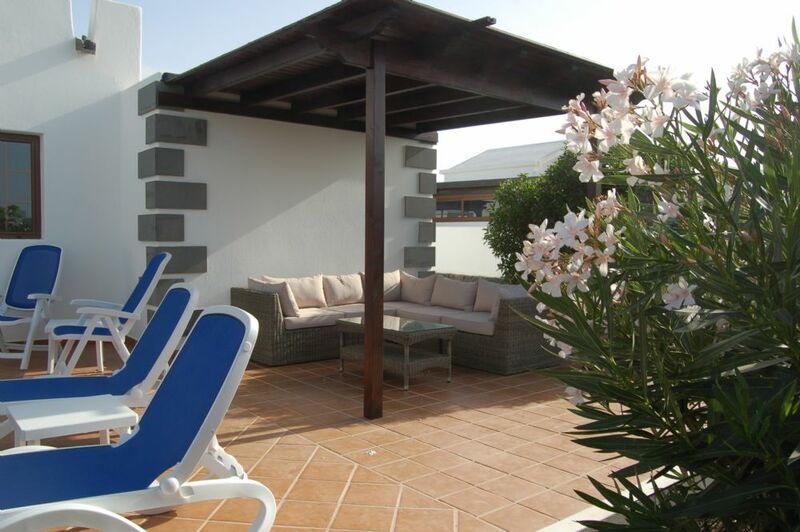 Stretch out on your sunbed and relax in the privacy of your walled garden. If you take a right out of Parque Del Rey, and walk towards the sea, you will see some tennis courts with a well trodden path, alongside. Take this and in no time at all you will be at the harbour. A traditional pretty harbour, with the small fishing boats and by contrast the grand ferry boats too. Punta Limones is the area you have walked to, and in the commercial center to your right, there are numerous bars, clubs and restaurants, including a wait for it…Chip shop! Popeyes serves great pub food, as does the Irish Anvil, entertainment is fabulous there too. Stride out to the left to discover the pedestrianised shopping street of Playa Blanca, admire the sea views in-between the shops, restaurants and bars, whether it is Tapas or Tipple you are after, you will find it here! 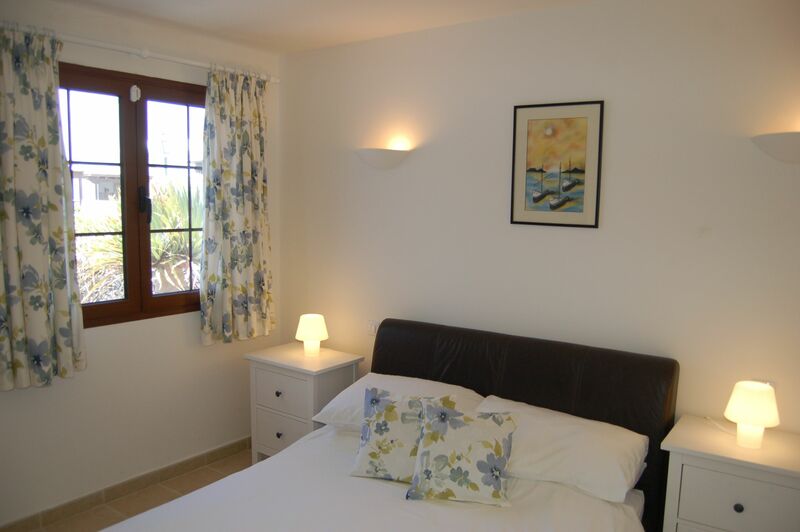 Lovely villa with everything you need, clean, well equipped and perfectly situated. We'll be back! 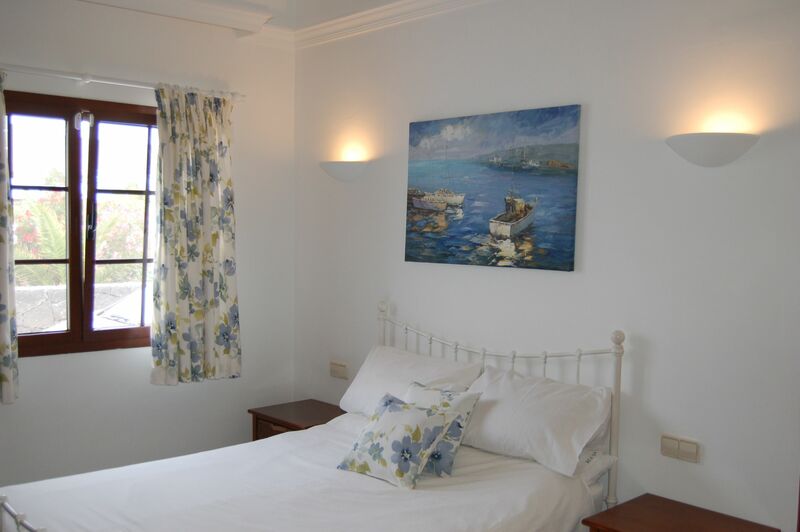 Casa Calma is a private & well kept villa within 15 minutes of harbour. The rooms are spacious & above all the heated pool is fantastic. An excellent stay & we will definitely return. Thank you for a great stay! The villa has everything we need. The pol is excellent, the villa is perfectly situated for the town, beach and water park and we enjoyed a suer week here.